By now, you may have come across some information on the health benefits associated with grounding. If you haven’t and you are unsure of what grounding is, it’s the process of connecting your body to the Earth. This can be done either by sitting or walking on the ground without shoes on. So the next time you are outside, take off your shoes! You can also use conductive systems while sleeping, working, or spending time indoors for a more convenient and lifestyle-friendly approach. We are bio-electrical beings and our bodies are made up of trillions (maybe more) of atoms that all hold an electrical charge, not to mention all of the other things we come into contact with on a daily basis that also hold an electrical charge. Electricians ground wires when they wire up a house, and we are taught about the importance of grounding electricity in science class, but when it comes to our own body, this is rarely – if ever – even thought about. Luckily, with the help of the internet, the importance of literally grounding ourselves is becoming more common. When you consider how little time we actually spend with our feet on the Earth, with no shoes on or even just sitting on the ground, this may start to make sense. When we are out in nature or going for a walk we have shoes with rubber soles on them – this directly interferes with the grounding process and inhibits our bodies from being able to do so. Although I knew of the importance and had heard some of the benefits of grounding I was completely blown away as to just how beneficial it actually was, and how many of the diseases and ailments that we are suffering from today could potentially be cured simply from grounding alone – after seeing the following video. People who ground themselves regularly have reported feeling more centered, solid, strong, balanced, less tense and less stressed. Simply, grounding makes you feel good and I can certainly attest to that after making an effort for the past week to do this as much as possible. I’m not sure if it matters but I get the feeling that because my job involves being on a computer and in front of a screen virtually all day, myself and people with similar jobs can especially benefit from grounding. I’ve been feeling a lot more chill and less stressed since starting my own little experiment. Just think of the last time you were on a beach or sitting under a tree at a park, how did you feel? I’d be willing to bet you felt pretty calm, relaxed and happy. Regular grounding can help relieve symptoms of inflammation and pain. A small pilot study involving 12 subjects was able to indicate that grounding the human body during sleep (often with a piece of metal connected to a wire that is connected to the ground) reduced night-time levels of cortisol and re-synchronizes cortisol hormone secretion to be more in alignment with the natural 24-hour circadian rhythm profile. In one instance, medical thermal imaging was used on a 44-year-old woman suffering from chronic back pain. Images were taken before and after being grounded while sleeping for 4 nights. The images showed reductions in inflammation and the woman also reported, a 30 percent reduction in pain, 70 percent reduction in the pain interfering with her sleep, 30 percent reduction in morning stiffness and soreness and after 4 weeks of continuous grounding while sleeping, she reported an 80 percent reduction in pain, no sleep interference and by 8 weeks she reported that her back pain was gone altogether. Sure, that is one instance, but in all honesty, it is such a simple thing to do if you are skeptical and suffering from pain, at least it’s worth a shot? Another study also showed how when grounded the diurnal rhythm of the stress hormone, cortisol, actually begins to normalize. Researchers examined the diurnal rhythm of cortisol after sleeping grounded and found a normalization of the rhythm. In addition, the participants of this study reported that they slept better and woke up feeling refreshed. Grounding also improves your circulation, which aids in the delivery of oxygen and nutrients to the tissues of the body, which includes better blood flow to the face. These findings were the result of a study that used a laser speckle contrast camera to quantify blood flow to the face after one hour of grounding. 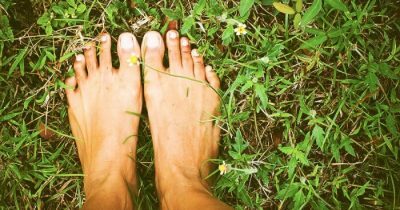 Simply by walking barefoot on the earth as much as possible or by sitting on the grass or ground. To take this even further, you could consider getting shoes that have no rubber or plastic soles or soles made from leather. Quite simply, modern human beings are disconnected – no pun intended – from the earth. This alone may be one of the primary causes for so much of the chronic pain, discomfort and illness we are seeing across the globe. Consider getting a minimum of a half-hour daily on the earth, you can even sit in your back-yard if that’s an option for you. You can sit, stand, walk on soil, grass, sand or even concrete. These are all conductive surfaces from which your body can draw the Earth’s energy, keep in mind that wood, asphalt and vinyl are not conductive. If this is difficult for you to achieve, there are a variety of grounding products available online that you can attach to your bed, or mats and chairs. If you suffer from pain and inflammation, this simple change might make all the difference.